If you've got the World's Best Mom, she deserves a special award. Print your favorite certificate to personalize. Choose your favorite color, or use a blank world's best mom coloring award and design your own color scheme. Each Adobe PDF mom certificate is designed to print on US letter size paper (8.5" x 11") in landscape mode. Resize using printer settings or Adobe Reader to fit other paper sizes. 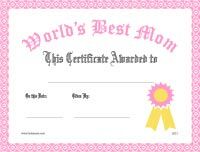 Soft pink border and lettering on a printable World's Best Mom award. 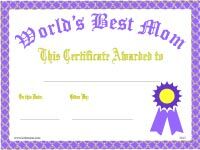 Lovely purple and gold World's Best Mom certificate. Create your own very special World's Mother's Day award with this printable black and white template or coloring page.